The Homestretch follows three homeless teens as they fight to stay in school, graduate, and build a future. Each of these smart, ambitious teenagers - Roque, Kasey and Anthony - will surprise, inspire, and challenge audiences to rethink stereotypes of homelessness as they work to complete their education while facing the trauma of being alone and abandoned at an early age. As their stories unfold, the film connects us deeply with larger issues of poverty, race, juvenile justice, immigration, foster care, and LGBTQ rights. 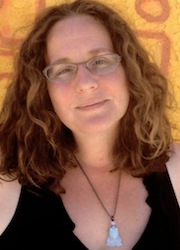 Anne de Mare is an award-winning playwright, director, professional video artist, and filmmaker. She completed her first documentary feature, Asparagus! Stalking the American Life, which broadcast regionally on PBS in 2009, in collaboration with Kirsten Kelly, her partner at Spargel Productions. Anne’s original plays have been presented in Chicago, London and New York, where she was a five-year resident artist with Richard Foreman’s legendary Ontological-Hysteric Theater. She is a founding member of The Independent Theater Company, The Nevermore Theater Project and Theaters Against War. Her video work has been seen on stage at Lincoln Center and at The Park Avenue Armory, and she is currently working with Innovative Music Programs to develop the film component of Accidental Heroes, a multi-media performance work based on the lives of eastern and western European artists coming of age during the Cold War.